I went to a fashion show soiree last night. My friend writer/gadfly Clint Catalyst organized the event for designer Jared Gold. Clint and I are both eclectic individuals and we have kind of a lot of random points of intersection. And we’ve both been doing what we do for a while. So the most unsettling part of the shindig was trying to place who people were. This is difficult when a person could be someone I photographed nine years ago and haven’t seen in between. Or the person could be someone who did my hair once. Or the person could be someone I’ve only seen in media. There is always a risk when greeting someone on dim non-specific facial-recognition alone because they could turn out to be someone you’ve only watched on television or MySpace or someone you would shoot (not with a camera) if you had a license to kill. But a significant portion of folks there are people I know and like but may not have seen recently. So it was like a real life wetware version of one of those aging programs they use to find missing children. 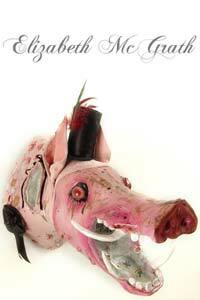 One person at the event I saw and could not place was artist/designer Elizabeth McGrath. I attended her Broken Dolls fashion show in like . . .